We carry a variety of Exterior Pilasters! We never disappoint our customers in the quality of our products. Our exterior pilasters are made of high-density polyurethane, are lightweight, durable and easy to install! They can also be used for interior applications as well. 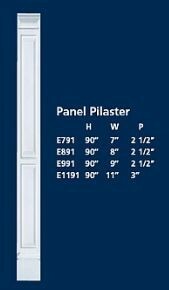 For matching pediments, please see our Door & Window Kits.